The only thing keeping the pressure on and in the news is the All For 1 R&P's and the Lawyers who are working on individual cases. The pressure is so great Waco is rushing to fix the Lady Justice statue on top of the court house. It has an arm missing. The media has posted pictures of it around the world each time we go to the Mclennan county court house. As if its going to make things all better and make the mean bikers go away and improve Waco's image. 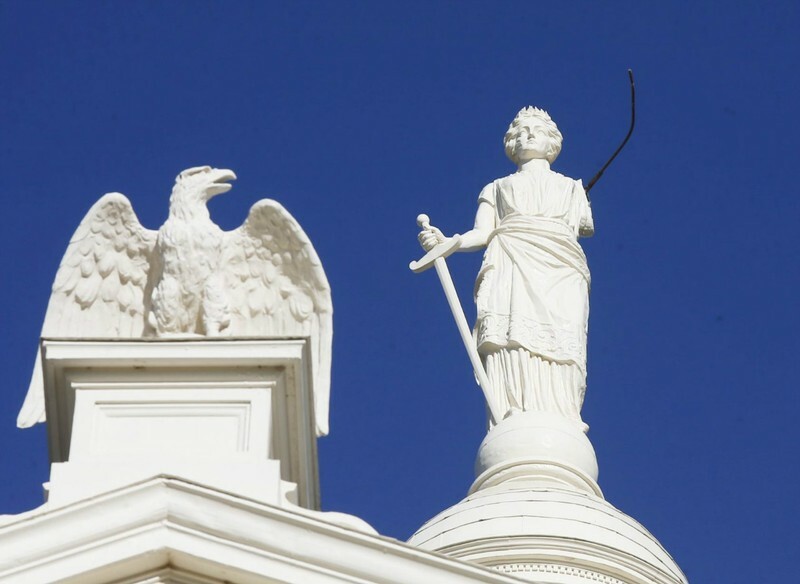 High winds knocked Lady Justice's arm off, we think its a message from God to the Waco Courts. The ego of Waco DA Able Reyna has him writing checks Waco can't cash. Once the wheels come off his wagon full of lies, innuendos and murder by WPD. The media will turn on them at some point. ​Its our job to get the media there and keep asking question and giving information our research teams dig up. Each week we learn more as we dig into the good ole boy system in Waco politics. It stinks! ​The tools given to us are more powerful than Able Reyna, the WPD and a corrupt court system. For those of us involved in the protests we realize this will be a long hall. Its nothing compared to what these families are enduring because of rogue police and court actions in Waco. Their lives are in ruins and changed forever. Standby as we get ready for the 3rd strike, we will not stop until we see some police officers in handcuffs. Why is Waco, Texas, fighting to suppress multiple videos of the shootout that killed nine bikers at the Twin Peaks restaurant on May 17? Why are some attorneys in the case now prohibited from talking to the press? And why haven’t Waco officials revealed how many of the nine victims were killed by bullets from police officers’ guns? Waco and its police department could be liable for millions of dollars in damages if litigants can prove that they arrested bikers without probable cause, violating their civil rights; or that Waco police shot and killed innocents. Scores of likely innocents arrested, suppressed video, clear conflicts of interest in the courts, and the possibility that multiple shooting victims died at the hands of police––the aftermath of the Waco shootout ought to be a prominent part of the ongoing national conversation about a criminal-justice system that routinely victimizes innocents. And by the time the truth outs, perhaps that will come to pass.